Relax in the La Caleta Beach in Hermigua, La Gomera. La Caleta Beach is located only a few minutes (10 minutes) from the centre of Hermigua. This beach is considered the best beach on the north of La Gomera. This is a very neat location very appreciated by locals and tourists. This beach has many facilities such as showers, picnic area and restaurants. 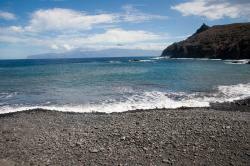 La Caleta, Hermigua, La Gomera.